When we first started in Nov 2006 in KL, our whole office was as big as our board room currently. Even though we only had handful of people on our team, our dreams were as big as KLCC towers. As we started growing our KL office we had new projects coming in and we expanded our business to JB in 2008. * Sila baca terlebih syarat kelayakan dan maklumat lain melalui link yang admin sediakan di tepi setiap jawatan sebelum membuat permohonan. Semoga berjaya semua..
Permohonan mestilah di buat melalui laman web Maukerja. Centurion Marketing Group is a leading Malaysian marketing organization. We specialize in Events marketing; community based marketing activities and Business-to-Business consulting. We work with Nationally and Internationally recognized clients from Banking & Financial division, NGO division, Telecommunications division, Insurance division and Life style division. For all the executives working in our company we focus on two most important things. First one is ongoing continuous training and support. Training for our executives is not just restricted to office. We provide office visits within Malaysia and also selected candidates will travel overseas which is part of training. Second one is work life balance. As a company we believe healthy personal life will have a big impact on one’s work life. As you are busy building your career with us we also want you to take time to take care of your loved ones. 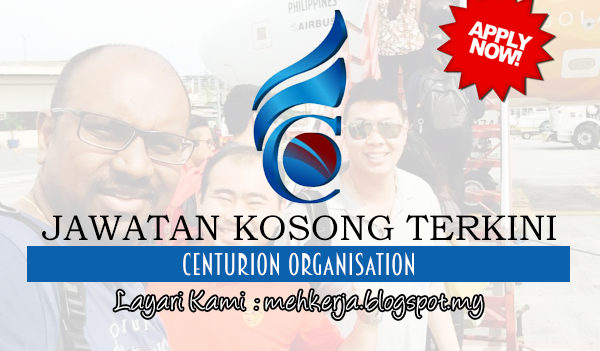 0 Response to "Jawatan Kosong di Centurion Organisation - 24 Oct 2017 [Gaji : RM1,800 - RM2,500 Per Month]"